The Delta Kite is great fun for beginners or advanced kite enthusiasts. Great Excitement as your Delta Kite lifts off for the first time and Soars into the Sky. Kite can be assembled in 1 minute. Spare parts included to keep you flying. Just add wind, 5-20 mph, and you're ready to soar. After the day of fun is over, your kite can be easily packed and stored in the carry bag for safe keeping. Click the Button at the Top of this Page to Start a New Adventure in Kite Flying! AWESOME BIG KITE TOY :Our kite stunt was crafted of high-quality, weather-resistant rip-stop nylon fabric materials and durable resin rods frame that holds the resistance of the wind very well. FLAWLESS CONSTRUCTION: Designed with fashion pattern in good carry bag packaging, Tresbro kite is great kite for travel, you can keep it in the car, at the beach house, or strapped to your bike. Lots of fun to fly on a vacation at a windy day. 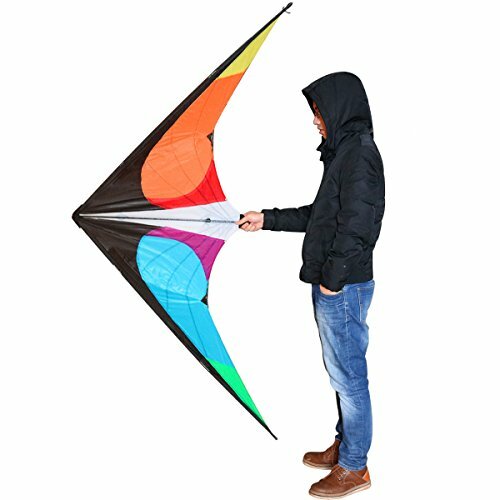 EASY TO ASSEMBLE AND FLY:Our lightweight large kite is excellent quality, good kite for intermediate and enthusiast a perfect sense of control,even beginners who wanting to learn how to fly stunt kites.It flies very nicely. UNIQUE KITE GIFTS:Great gift idea for boys, girls,teens, your family all ages.You can take it as a birthday gift, anniversary, even kite collection. Use it any open area, from beaches to parks, and enjoy spending quality time with your family a great memories. 100% SATISFACTION:Get outside and start flying,if you are a rookie kite flyer, you should warranty this amazing kite from sea-tree-river loss.If you don't like our huge kite,No worry,we provide 100% no-asking return or replace guarantee.